Heya pretty ladies, Hope you all are doing good. 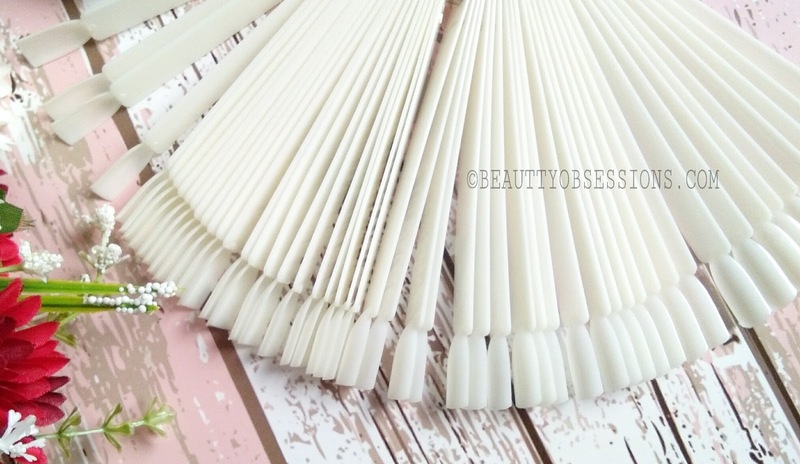 Recently I have got an interesting product from beautybigbang and that is obviously a nail product. I got these 50pc. nail tips stick which is definitely a life saver for any nailart lover. So in this post I am going share my quick view on these babies. 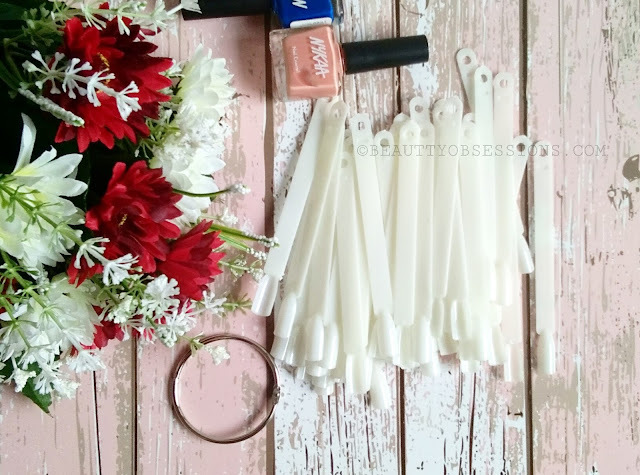 If you are not aware of what are those, then let me tell you, these fake nail tips are really helpful if you are into nailarts or if you have nail salon or if you have so many nail polishes. These are actually nail colour displays. If you have so many shades and you want to keep a track on your nail polish collection, then simply paint these nail tips one by one with the shades you own and you are pretty much sorted. If you own a nail salon ,then these can be use as nail colour display. I personally got these to practice new designs .. Each time I can't paint my own nails to practice and these are the best option to make everything handy. Let's disciabout these quality and other features.. 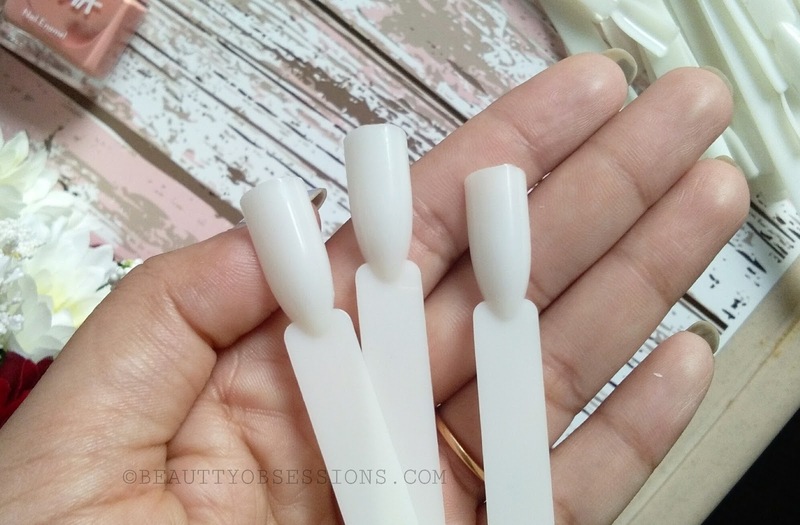 These nail tips are made up of plastic and these are very lightweight and thin. If you will put more pressure, then these might break. There is a ring provided with these tips. You have to put all the tips into that ring to make it convenient to use. There were two types available on beautybigbang i.e. transparent and white and I choose the white shade. These nail tips are going to be helpful for me while doing swatch videos. I am super happy by getting these. By the way beautybigbang has awesome collection of makeup and nail products, you should definitely check out. They do accept paypal payment and you are going to get your parcel within 2-4 weeks. The great part is everything is on free shipping and they do ship worldwide. Use my coupon code SNIG10 to avail extra 10% off across the site. I have also got some makeup stuffs. Will share in another post. . Hope you found this post helpful. See you in the next post, till then take care..
Wow beauty space has undergone so much of revolution. I wasn't aware of any such products for nails available in the market. Really happy to see and read about the same. 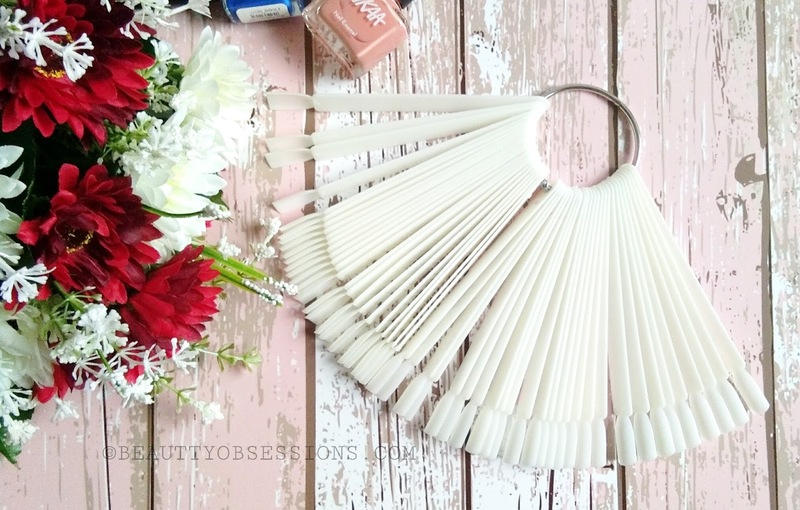 This is so neat way to get a lovely nail art without any hassle. I really like this product would love to get so that I can experiment with my nails. Never knew about such things. Can please share how can we use this tool?